Genesis- Various thoughts and notes on a Saturday night. Now, this is certainly traditional. But I think the manual’s reinforcement of the simplicity of the tradition creates problems, as per Julie’s excellent post on The Next Generation’s Faith Crisis. Moreover, it’s a tradition that we have not examined closely or often, with rare exceptions. It’s a tradition we have often shared with conservative Protestants and Jews, although with a difference. Asserting Mosaic authorship in that Protestant context, then, is less a scholarly argument about the actual authorship of the text as it exists today and more about declaring one’s allegiance of sorts to a certain school of thought, marking him as a faithful insider. I’ve found half a dozen others making similar declarations: Moses wrote it, but he adapted preexisting (Mesopotamian?) sources, and it’s been (heavily?) edited since he wrote. Heck, the LDS Bible Dictionary says as much. The Pentateuch was written by Moses, although it is evident that he used several documentary sources from which he compiled the book of Genesis, besides a divine revelation to him. It is also evident that scribes and copyists have left their traces upon the Pentateuch as we have it today. In speaking of LDS history, B.H. Roberts took some fire. His response applies a bit to my critique here. One major issue confronting OT scholars, particularly in Genesis, is the relationship between the various creation accounts, flood account, and other often-similar ancient Near Eastern accounts. Hugh Nibley wrote about this in the New Era in 1971, “Myths and the Scriptures” reprinted in Old Testament and Related Studies (now available online here.) With a few quibbles on my part, he captures it well. A student confronted for the first time by classical and Oriental [read: ancient Near Eastern] myths that read like reruns of well-known Bible stories—such as the garden of Eden episode and the Flood—often goes into a sort of shock, emerging from which he announces to family and friends that he has just discovered a fact of life: the Bible is just a lot of mythology. Such a conclusion may be the result of a faulty approach to the Bible as well as to the myths. The first thing to do in such a case is to apply cold packs and calm the student down, pointing out to him that such deeply religious writers as Dante and Milton not only were aware of many parallels between Christian and pagan lore and imagery, but also freely mingled the two together in constructing their faith-promoting epics…. The clergy, Christian and Jewish alike, have insisted before all else on the absolute originality and uniqueness of the teachings of Christ and Moses respectively, laboring under the strange illusion that if anything coming from any other source shows a close resemblance to those teachings, the claims of the founders to originality and hence to divinity are in serious jeopardy…. Secular scholars, on the other hand, have been quick to take any resemblance between heathen traditions and the Bible as absolute proof that the scriptures are simply ordinary stuff. The classic example of this was the Babylonian flood story, discovered by Layard in the mid-nineteenth century. It resembled the biblical account closely enough to show without doubt that they were connected, but before any search for the source of either version was undertaken, it was joyfully announced that the biblical account was derived from the Babylonian and was, therefore, a fraud. The experts were wrong on both points—the Assurbanipal version is really a late redaction…. Kenton Sparks is a scholar I’ve recently discovered and read enthusiastically. I first saw his very important article “Enuma Eliš and Priestly Mimesis: Elite Emulation in Ancient Judaism” (Journal of Biblical Literature 126:4, 2007). Sparks argues that the author of Genesis 1 knew Enuma Eliš intimately, and emulated, borrowed from, and argued against it. Intrigued, I hunted down his “The Problem of Myth in Ancient Historiography” in Rethinking the Foundations: Historiography in the Ancient World and in the Bible : Essays in Honour of John Van Seters (You can tell it’s academic because they spell “honour” like a Brit, and it has a German sub-subtitle.) Also turns out to be quite relevant to my book. I went looking for his books. How are Christians to understand Scripture when it directs God’s people to slaughter Canaanite families—men, women, and children—merely because they have false religious beliefs that could unduly influence Israel? And what are we to do with the many biblical texts that explicitly or implicitly support slavery, sometimes permitting slave owners to beat slaves or to treat foreign slaves more harshly? And what of those texts that regard women as property or as second-class citizens, in some cases forbidding women to speak in public worship? One can easily make this list very long. if we carefully consider the most profound differences between the Old and New Testaments, we will notice soon enough that the biblical authors themselves were uncomfortable with the violent streak in some biblical (mostly Old Testament) texts. In Scripture, God speaks to us through the finite and fallen perspectives of human authors and, thereby, through the limited and fallen horizons of human cultures and audiences. And the process whereby he accomplished this was and is very human, both in the production of the individual biblical books themselves and in the lengthy historical process—both Jewish and Christian—that finally produced our respective canons of Scripture (Jewish, Catholic, Orthodox, and Protestant). When scholarship strikes us as an excessively esoteric pursuit of exotic meaning, this is mainly because historical and cultural distance has made the text’s ordinary (or literal, or natural) meaning more difficult to grasp than is the case for a modern newspaper or novel. Just as uninformed readers will mistake Gulliver’s Travels for a mere children’s tale (rather than the political and intellectual work that it also is), so uninformed readers will tend to misunderstand the Bible. A more striking example of the redemption of Scripture is provided by the Gospel of Matthew as a whole. Like other early Christians, Matthew viewed Jesus as the “new Moses” prophesied in Deut 18:15: “Yahweh your God will raise up for you a prophet like me from among your own brothers. You must listen to him.” This is why the life of Matthew’s Jesus closely parallels the life of Israel’s ancient lawgiver.6 Like Moses, Jesus was born as a savior. Like Moses, a foreign king tried to kill him. Like Moses, Jesus was hidden from the threatening king in Egypt. Like Moses, Jesus fasted in the desert wilderness for forty days and nights. Like Moses, Jesus returned from that desert experience and taught God’s people on the mountain. And in that Sermon on the Mount he presented his teaching as a new law that reversed and fulfilled the law of Moses. Also, in Matthew as p 69 a whole, the teaching of Jesus is presented in five sections, each ending with the words “When Jesus had finished saying these things.” This structure parallels the five books of Moses that stand at the beginning of the Old Testament. Once we realize that this was Matthew’s intention—to present Jesus as the new Moses of prophecy—then we are in a better position to appreciate the conclusion of his Gospel in Matt 28:16–20, commonly known as the “Great Commission.”Readers will probably recall that, because of his sin, Moses was not able to lead the Israelites into the Promised Land. At the end of his life, he stood on a mountain overlooking the land and said to the Israelites, “I cannot go with you, but God will be with you.… Go, and kill all the nations.” This parallels very closely what we find at the end of Matthew’s Gospel. Jesus takes his disciples “to the mountain” and there speaks his own final words: “Go, make disciples of all the nations … and I will be with you.” It is quite clear that Matthew wished to portray Jesus as a better Moses, who, because he was sinless, could address his followers from within the land and could extend the promise to be with them in their mission. Particularly striking, of course, is the profound contrast between the two missions: “kill all the nations” (Greek panta ta ethn? ); “make disciples of all the nations” (again panta ta ethn?). Matthew apparently means to teach us that the true fulfillment of the command to kill the Canaanites is actually found in our efforts to convert the lost to faith in Christ. The Gospel is thus understood as a spiritual conquest in the name of Christ and for the good of the nations. So the Gospel of Matthew is a deliberate and sustained attempt to redeem the Old Testament law and make it serve the purposes of the Gospel of Jesus Christ. Highly recommended, particularly if you struggle with the OT, as you probably do if you’re reading it closely. This is a more technical version of the above, apparently. I haven’t read it yet, but some people I like highly recommend it. This is a reference work of sorts dealing with different ancient genres. Also recommended, but as a reference book. 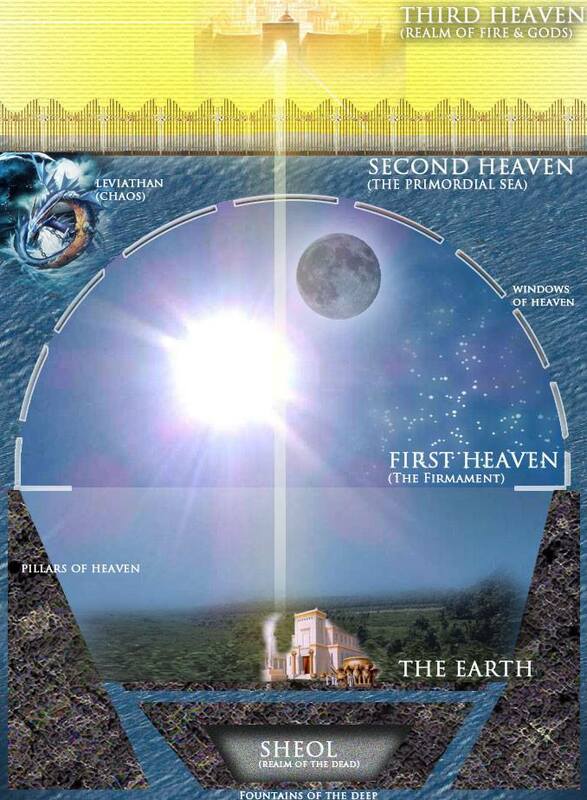 One depiction of Israelite cosmography, the inverse snow globe with the water outside. Two other accessible books have crossed my desk recently. The phrase “image of God” occurs only three times in the whole OT, and all of those in what’s called the Primordial History, or Genesis 1-11. WE first find it in 1:26-27 where ‘adam or humankind is created in the image of God. Outside the Bible, typically only kings were said to be in “the image of (a) god”, and the Bible here is engaging in some democratization and polemics by applying it to all humanity. For more on cosmology, see my posts here and here. And my book? It’s progressing. I tell you honestly, though, after working on it for several years, and being interested in the topic for 15 years… trying to submit a complete manuscript by August 1 (my self-imposed deadline) still feels rushed. There is so much to read, so many questions to deal with, and trying to do it in clear, concise prose that doesn’t make you want to poke your eyes out just adds to the stress. Still, it’s something I’m passionate about. Thanks Ben. This is a treat as always. I think I have some additional reading suggestions, but I can’t think of them at the moment. Excellent information. I went into this also in my book “Help thou mine unbelief” just published last year. It’s a topic I think we need to get into our lessons and talks because so many are in crisis over feeling a mandate to accept the scriptures as literal. Good luck with your book. I’ll be reading it. Nice post, Ben. Very informative. FarSide- I’m a big fan of Enns , and have often mentioned or pushed his works in posts. I wish all LDS would read his Evangelicals and the Problem of the Old Testament, since so much of what he says applies to Mormons as well. I haven’t read his newest yet, but the review at BCC made it sound like he’s trying to use humor to reach a new audience. He does have a blog that I follow, which is where I get some of my book suggestions. Sparks is kind of my new Enns. I’m okay with the Seminary manual teaching the common belief we share with Jews and other Christians regarding Moses’s authorship of Genesis. After all, it is aimed at adolescents. I never went to Seminary (I joined the church at the end of my senior year in high school), but I knew of Moses’s authorship because that’s what Genesis says. To learn a little later that some “experts” surmise that Moses assembled Genesis from oral tradition was not a deal breaker but was only an additional perspective — and to learn a little later that others may have edited the text also wasn’t a deal breaker for me. The manual needs to teach something, but it cannot teach everything. So I’m okay with it in that regard. Imagine the total worthlessness of a manual that taught the creation stories and then called them myth, and taught that Adam and Eve is a myth, and the flood is a myth, and Job is a myth, and David is a myth, and Jesus is a myth, and the cross is a myth, and so forth — the value comes in accepting the stories as real, as seeing real people in them — there is where one finds the faith-building strength of the stories. To whatever degree the Seminary manual tries to build faith, I want to be supportive of it. Whatever it doesn’t include, the readers will be able to learn elsewhere and they will synthesize their learning and grow from it. Just because the Seminary manual doesn’t say something doesn’t mean the students are forever prohibited from learning it. I’m teaching a lesson to the five-year-olds in Primary later this morning. It will be a simple lesson, but one, I hope, that strengthens faith. What was bad about Ben’s hypothetical statement that the manual could have made? It seems to me that it takes as much space and acknowledges all the issues he notes in the post. Imagine the “total worthlessness” of a manual that teaches these literally. Ben’s not declaring the Bible false, just that we should consider genre while studying it. I don’t see why that is objectionable. I don’t find the seminary manual objectionable. I don’t find the original posting objectionable. I just don’t think the manual can include everything that everyone will want it to include. So I sustain it as a product of good people trying to do a good work, with editorial constraints, aimed at a particular audience. Everything else that others want to teach will find their own times and places, and I sustain that, too. But for children and youth, and also in great measure for adults, the faith-building value in the stories of the scripture comes from approaching them as real rather than mythological. For example, the value in the considering the Adam and Eve narrative is most fruitful when a man or woman thinks of him- or herself as Adam or Eve. When these youth do later learn of different ways to approach scripture, they can synthesize the different approaches into something that works for them, each in his or her own way. I guess I’m just saying that I’m okay with the Seminary manual presenting the stories as real, and I’m okay with a university professor presenting them as myth. We have an assumed dichotomy of “real rather than mythological,” in which “real” has value but “mythological” does not. “when a man or woman thinks of him- or herself as Adam or Eve”- This is certainly neither “real” nor predicated on historicity or historical accuracy! Moreover, my proposed rewrite is neither lengthy nor overwhelmingly academic. It’s not a burden, an addition, nor require any special training or insight. It’s just a little bit looser. Jared*, thanks for the comment. I remember that post. It would have been so easy to take the same approach for Genesis. In speaking privately with Hugh Nibley about this issue (in the late 1980s), he reaffirmed his comments quoted by Ben S. He made a statement which I don’t remember exactly, but which I DO remember led me to Alma 34:15 (and, to a lesser degree Alma 13:16). At the end of his statement about the necessity for a “great and last sacrifice” (34:13), Amulek explains that the sacrifice, “will be the Son of God, yea, infinite and eternal” (34:14). He goes on to say that “thus he shall . . . [bring] about means unto men that they may have faith unto repentance”. (34:15). While I recognize the ultimate sacrifice of Jesus, the act itself provides the “means” that we “may have faith unto repentance”. Somewhere in all this is the line between the “historical” and the “mythical”. I can’t wait for your book, Ben, so while August seems rushed to you, its a long time to us. The following blurb appears on the first page of the Old Testament Study Guide for Home-Study Seminary Students — the manual writers might be interested in your inputs — there might be a reason they chose the traditional approach, and they might share their reason if you ask. Chesterson’s fence and all that, you know. I’m still working from the mindset that they’re good people trying to do a good work, but I know my mindset is not universal. Anyway, your thoughts might make their way into a future edition. I’m also in line for your book, and from the outline I read on your blog, I think it’s going to be a significant contribution to our discourse about the scriptures. I reviewed Enns recently as well, and the reason I appreciate his approach over others is he does a good job of explaining the scholarly consensus where there truly is one, while allowing for other possible explanations for how the scriptures “behave” (one of his favorite terms). The tentative tone of some of his explanations has the effect of helping us take him more seriously. The Church definitely has a problem in making ill-grounded assertions about history and scripture that set people up to question the Church’s credibility when better information is encountered in other places; this is an issue we all have beaten to death. But scholars have the same problem when they overstate their case, and Enns does a good job of avoiding that trap by encouraging his readers to keep an open mind. Again, I’m looking forward to the book; from your outline, it looks like one I’ll be buying for myself, with multiple copies to pass along to family and friends. Myth is predicated on oral cognitive functions, which has its own rules about history. We modern readers of a scriptural text assume that all peoples think like we do, forgetting that much in the Bible did not begin as text… but as oral tradition. Oral tradition is not text in spoken form. Rather, oral tradition has its own rules of information management which are very different than our modern and literate expectations. Oral tradition is wed to festivals, rituals, temples, dances, songs, and to oral cosmology. Reading a text that descends from this complex of traditions where all the oral stuff has been removed is like reading Egyptian without the Rosetta Stone. It cannot be done without making the text a caricature of its former self. The Church sets itself up to fail, as the last poster has noted, when it perpetually recites distinct authorship or even literate interpretations of oral traditions as literal fact. I do not believe the Church Correlation does this on purpose. I think almost everyone working on the manuals is doing their best with what they know. Alas, times are changing and the old ways are no longer sufficient for a great many people, and it takes a massive institution like the Church a very long time to react. It has always been this way. My personal solution would really not be to change the manuals much at all. After all, the lessons tend to be simple outlines of gospel principles. The problem comes when too many Mormon take these outlines as literal and exact, as so many do. A small introduction in front of the manuals addressing Ben S.’s concerns is very much needed. The Church should briefly address the complexities of historical interpretation, the differences between a devotional and historical approach to scripture, and the often messy transcription process as texts descend from generation to another, and from one culture and language to another. In the very least, this would allow people to consider the complexity of history and authorship as they read the text. Such an introduction need not be long either, but simply introduce the ideas. Meanwhile, people like Ben S. hold the flame. And there are a growing number of LDS who are doing the same.